'Can't predict next landslip' Jump to media player Up to 150 homes could be affected by landslips which forced 10 properties to be evacuated. 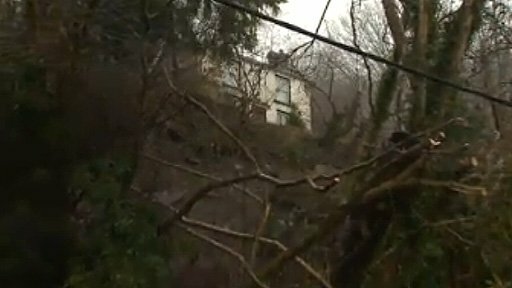 Road blocked in landslip village Jump to media player Engineers have been assessing the damage to homes in Ystalyfera in the upper Swansea valley after two landslips brought thousands of tonnes of soil down onto a road. Residents spent the night in a leisure centre after 11 homes were evacuated. Up to 150 homes could be affected by landslips which forced 10 properties to be evacuated, the leader of Neath Port Talbot council has said. About 20 people were told to leave a terraced row in Ystalyfera after mounds of earth fell down the hillside. One empty property in Cyfyng Road is set to be knocked down. Council leader Rob Jones said the local authority "can't predict where the landslides will occur".